Every year the government revises the income tax slab rates during the budget. Various deduction are allowed to a taxpayer under Section 80C and Section 80D. 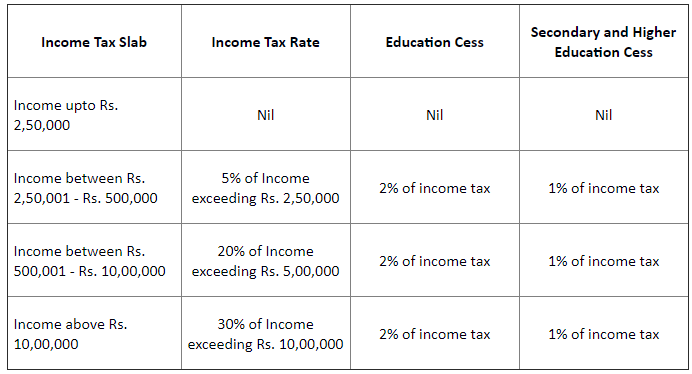 Now that the Union Budget 2018 is just around the corner, let's have a look at the current income tax slabs, wherein, individual incomes are categorised to pay tax to the government. Income tax is a percentage that individuals or corporates pay to the government from their income. 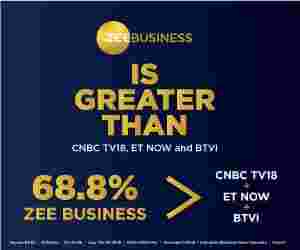 This income is categorized in different groups on the basis of the amount of income. Each group is known as tax slab. 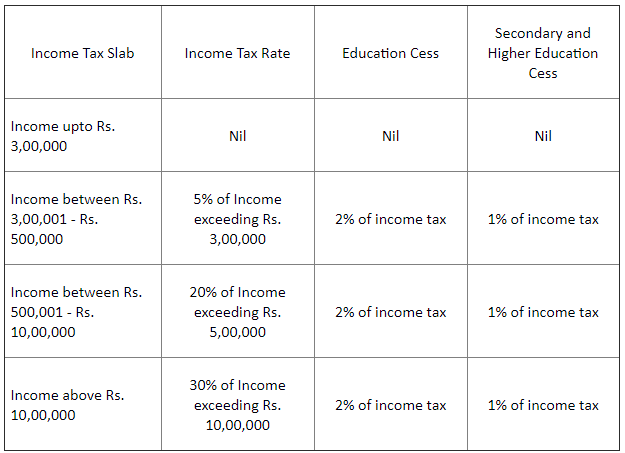 Usually every year, the income tax slab rates are revised during the budget. Various deductions are allowed to a taxpayer under Section 80C and Section 80D. Finance Minister Arun Jaitley announced changes in the I-T slab in the budget 2017, here's what they say. If a person has annual income up to Rs 2,50,000, they are not liable to pay any sort of tax. In case, the annual income is between Rs 2,50,000 – Rs 5,00,000, then a person will have to pay 5% tax along with 2% education cess and 1% secondary & higher education cess. If they earn between Rs 5,00,001 – Rs 10,00,000, they will have to pay 20% tax along with 2% education cess and 1% secondary & higher education cess. A person having an annual income above Rs 10,00,000 has to 30% tax with 2% education cess and 1% secondary & higher education cess. If the annual income exceeds Rs 50 lakh up to Rs 1 crore, you are liable to pay 10%. And a person having an income above Rs 1 crore, has to pay 15% tax along with additional 3% service charge. After reaching 60 years of age, a person is exempted from tax on earnings up to Rs 3,00,000. However, they have to pay 5% tax on earnings from Rs 3,00,000 to Rs 5,00,000, and between Rs 5,00,001 and Rs 10,00,000 the tax rate of 20% is levied and those who earn above Rs 10,00,000 have to pay 30% tax. Apart from this, they also have to pay 2% income tax on education cess and 1% tax on secondary and higher education cess. Similar is the case for taxpayers who earn between Rs 50 lakh and Rs 1 crore, and above, if they attain 60 years of age. Senior citizens are tax exempted on annual earnings up to Rs 5,00,000. If they earn between Rs 5,00,001 and Rs 10,00,000, they are liable to pay 20% tax. While on earnings above Rs 10,00,000, a tax of 30% is charged. 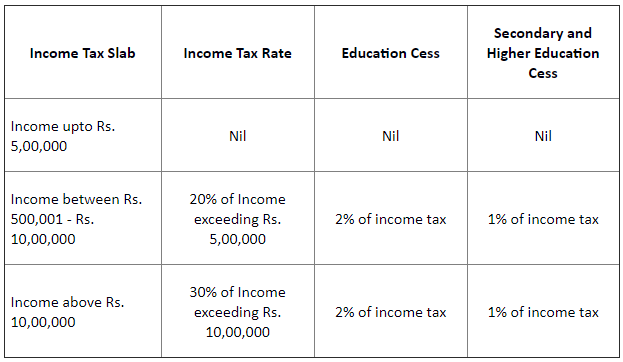 Tax rate on other cess is similar like above. HUF is a separate entity for the purpose of assessment under the I-T Act. Under Hindu Law, an HUF consists of all persons lineally descended from a common ancestor and it includes wives and unmarried daughters. An HUF is tax exempted on earnings up to Rs 2,50,000. 10% tax is charged on earnings between Rs 2,50,000 and Rs 5,00,000, while 20% on earnings between Rs 5,00,001 and Rs 10,00,000 and it increases to 30% over Rs 10,00,000 income. Association of Person is defined as a person under Section 2(31)(v ) of the Income Tax Act. These entities are charged with 10% income tax on earnings between Rs 2,50,000 and Rs 5,00,000. While earnings group between Rs 5,00,001 and Rs 10,00,000 and above Rs 10,00,000, has to pay income tax of 20% and 30% respectively. Earnings till Rs 2,50,000 is tax exempted. Similar tax rates are levied on legal entities registered as bodies of individuals. It may be noted that Partnership Firms and LLPs (Limited Liability Partnerships) are taxed at the rate of 30%. 30% tax rate is also levied on entities acting as local authorities and domestic companies. 10% of income tax is levied on co-operative societies for their income up to Rs 10,000. While 20% on the income between Rs 10,000 and Rs 20,000. If co-operative societies have income above Rs 20,000, they will pay 30% tax. Interestingly, only 2% income tax is levied on their earnings over Rs 1 crore, and 5% on earnings above Rs 10 crore. Furthermore, they also need to pay 2% education cess and 1% secondary & higher education cess. Remember that education and secondary & higher education cess is also levied on the income tax along with surcharge.